I have started going over my newly acquired bike in order to familiarize myself with her. Changing fluids, brake pads, cleaning contacts etc. Lots of "gunk" in the radiator expansion chamber. I have drained the radiator but what is the procedure for the expansion chamber ? It looks in dire need of some cleaning. I didn't find the answer in the Haynes manual. Just want to check with the gurus before I start creating more problems than i prevent. Take it off the bike and rinse it out with H2O. I have removed mine and fitted a baby feed bottle instead. thank you for the response ...and patience answering my overly basic questions. i was wondering if there were any special considerations. My first watercooled bike, so climbing the learning curve.. If you are ever in department 24, let me know. Will (88) is arriving here on Sunday. It's a good idea to flush the entire cooling system. Fill it with distilled water (only) mixed with a good quality alloy compatible silica free coolant. I use the OEM coolant as there doesn't seem to be much difference in price between it and other brands. Mix to the requirements of your climate and change every two years. If there was a lot of gunk coming out of your cooling system when you flushed it, you might want to use a good quality alloy compatible coolant flush. However be aware that sometimes using a flushing agent will reveal the past sins of previous owners. Any stop leak products added previously could be rendered inoperative exposing any leaks. Available antifreeze/corrosion inhibitor is pre mixed in France and needs no dilution. Modern products do not need changing every couple of years and last for 5 years or more. The OEM coolant made in Germany must be diluted according to the temperature the bike is running in. I went over the instructions on the bottle and could not find anything on suggested longevity. The manual states it must be changed every two years. But due to the fact that the bike is now twenty five years old give or take, maybe that has changed. I had a quick look for OEM product specifications but I could not find anything. I will keep looking. Thank you for your input Martin, much appreciated. Great pointers for me who's just starting to learn about water cooling. Every two years is the frequency from the maintenance schedule I believe, and I have bought the oem coolant that states 50/50 solution. Bob, will definitely let you know when I pass by 24. I googled it without realizing I walked into the epic ongoing battle of Tap vs Distilled. It's like asking what is the best oil to use, mineral, synthetic, semi synthetic. And if you really want to stir the possum what's the best brand. Seriously some coolants including the OEM one can go five years, but for the extra small amount that is involved I'll keep changing every two years. Ingredients that form the coolant can degrade over time. Yes I agree. The question is as much emotional as rational. I tend to follow maintenance schedules. I just need to find a way to install those quick connects so removing the gas tank doesn't become the main hurdle for doing preventive maintenance. And for oil, semi-synthetic is obviously best....unless the seals start to leak...In which case it's mineral.....or you live in the Sahara desert..then it's synthetic....or possibly lawnmower syrup. What I am saying is that engine coolant has come a long way since the 1980s. If you really want to use old tech stuff that was the best available at that time then do so if you can find it. Go the whole hog and fit 1980s technology tyres, battery, etc and use oil from that period too. Coolant that you buy in France these days is pre mixed and can be bought everywhere. It is fine to use in any modern turbo car engine, that contains many different materials, and is left in for 5 years. You should not add any water to it as it is pre mixed. Your bike use what you want and not what others want you to use. And for oil, semi-synthetic is obviously best....unless the orings start to leak...In which case it's mineral.....or you live in the Sahara desert..then it's synthetic....or possibly lawnmower syrup. The best oil is the one that lubricates best. Inside your engine there are metal bits rubbing together, just as they do in any car engine. 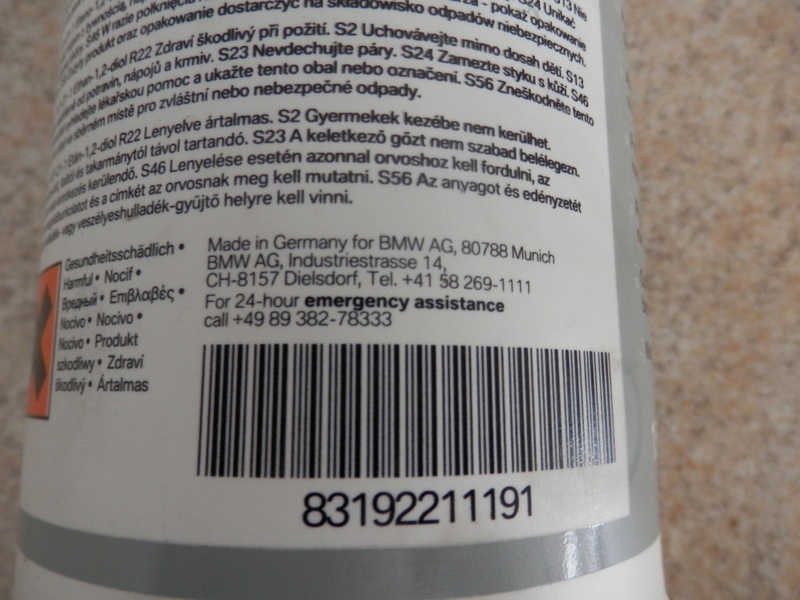 Go to any BMW car dealers and see what they use, it will be fully synthetic. In the 1980s they would have used mineral. As I said before, it is your engine, use what you want. The 5w40 fully synthetic from Leclerc works absolutely fine in my K100RS and in all my more modern Ducatis too. Never use tap water in your cooling system. Anything other than distilled will contain dissolved minerals, mostly calcium which will precipitate at the operating temperature of the engine, coating all the internal surfaces of the cooling system with an insulating layer that will prevent the efficient transfer of heat out of the engine. I bought my K100 for a low price because it was overheating due to heavy scaling due a previous owner using very hard well water in the cooling system. It took three days of soaking in vinegar to get the deposits out of the radiator alone followed by doing two flushes with vinegar to descale the engine internals. The flushing fluid looked like mud when I drained it. Today, the engine runs at normal temperature even when stuck in traffic in ambient temperatures as high as 90+F. I will go with distilled as well as the water in Paris contains lots of minerals too. It's there a way to check the level of scaling / damage caused by previous owners ? I've opened a can of worms, premix coolant still has water in it. I would rather get the OEM concentrate and mix it myself. With the concentrate you are not paying for the water, and the larger container. By and large we want everything done for us these days, premixed and cooked food, the list goes on and on. @MartinW wrote: I've opened a can of worms, premix coolant still has water in it. I would rather get the OEM concentrate and mix it myself. With the concentrate you are not paying for the water, and the larger container. By and large we want everything done for us these days, premixed and cooked food, the list goes on and on. Who are you referring to when you say OEM? OEM stands for Original Equipment Manufacturer as in BMW. @MartinW wrote: OEM stands for Original Equipment Manufacturer as in BMW. 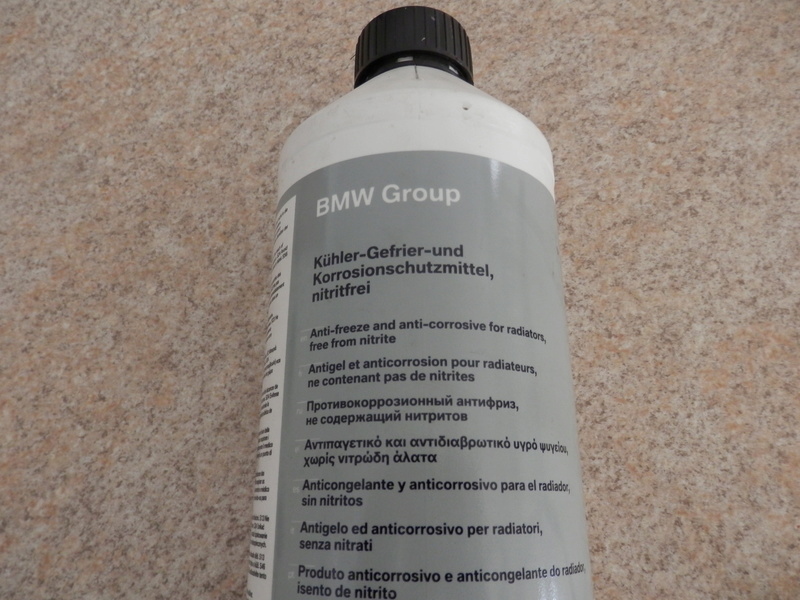 I think that you will find that BMW never made anti freeze. I've always been intrigued by motor vehicle manufacturers insisting that 'Nissan' engine oil must be used or 'Toyota' coolant for example, must be used in their respective vehicles. As far as I know, Nissan or Toyota or any other MV manufacturer do not make oils or coolants.... so I guess oils or coolants are sourced from oil and coolant makers. I stand to be corrected on this. Oil and coolant makers I suppose make products to specs. provided by the MV manufacturers. I've been using it for twenty years. Tom, you will find that all liquids are made to specifications of some sort, but common fluids like antifreeze and brake fluid are specs for that fluid rather than manufacturers specs. As an example I had a car that had a particular engine in it that was made in 1981, the oil stated in the owners manual was to be API CC/SD and be changed at 3000 mile intervals. That engine was used in many vehicles for about 25 years, but as oil specs improved the last versions were to use API CF/SG and had to be changed at 12000 miles. The engine was basically the same. The API is the American Petroleum Institute, so the specs are theirs, but the car manufacturers quoted them. As with brake fluid which is a DOT standard and our bikes use DOT3 or 4. There are specs for 2 stroke oil, fuel and all sorts of fluids. what about the reservoir ? Your reservoir is probably full of calcium scale. The cheapest way to get rid of it is to soak it in white distilled vinegar for a day or so and then do a good rinse with lots of fresh water. If the tank is full of crap, I would suspect the cooling passages are even worse. In that case, drain and refill with vinegar, run till at operating temperature and an overnight soak will clean it out. Drain and flush with distilled water until flush comes out clear. Then refill with a mix of antifreeze and distilled water.